Outdoor living areas in desert environments require special planning and many options are available of which you may not be aware. Outdoor entertaining in desert areas can be a year-round pleasure with the right equipment and accessories. Outdoor living spaces offer a relaxing atmosphere for spending time with family and friends that adds value to any property. A well designed outdoor area offers the equivalent of adding an entire room that can be a focal point for a variety of activities. Today’s outdoor living space is much more than a picnic table, umbrella and movable grill. It’s an extension of your home and personality. Don’t make the mistake of minimizing design elements as if you were creating a rustic campground. Feel free to experiment with different looks and styles during the design phase to transition basic backyards into luxurious environments for enjoying life. Your outdoor living area is a place for family, friends and fun. Determine how the space will be used and invest as much thought and planning into the area as you would inside your home. An outdoor living space should reflect your style, taste, and be a welcoming, luxury environment. There’s no need to shy away on creature comforts. 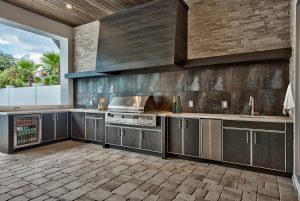 You can select free-standing high-end Alfresco and DCS grills, smokers with sleek, elegant designs or an entire custom outdoor kitchen can be created with sinks, refrigerators, pizza ovens, cabinets and pantries. 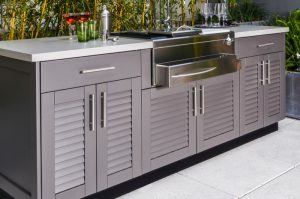 Outdoor kitchens can be customized to fit small areas or can serve as kitchen, bar and dining areas, while prefabricated BBQ islands offer an alternative at a fraction of the cost. There are many styles available to accommodate different looks. You can choose a stylish fixed or mobile heater, outdoor fireplace, fire bowl or fire pit to provide warmth on chilly evenings that operate by burning wood, natural gas and propane. New Bromic styles utilize infrared heating technology and some electric versions are mobile or can be permanently attached to a structure. Table top models are also available. When selecting your patio furniture, choose high quality cast aluminum with welded frames and powder coating or all wicker pieces that are able to withstand harsh desert climates. If you have space constraints, consider items that can provide seating and storage such as ottomans. Highly durable Sunbrella® fabrics withstand arid areas, are child-friendly and easy to clean. Don’t forget to add some decorative pillows for lounging and select patio furnishings that offer the plush comfort of indoor furniture. Illuminate your outdoor area with electric or solar lighting for safety, to create focal points within the environment, or set a specific mood. Lighting possibilities run the gamut from decorative lanterns, lamps and sconces to suspended lights and pillars. Specialized lighting can also be incorporated into water features or added as free-floating flourishes in water features. Plants provide privacy, enjoyment and they can have a cooling effect on their surroundings. Choose your foliage wisely with species that can withstand high temperatures and survive with limited water requirements. If you really want lush greenery, consider arranging strategically placed potted plants throughout the area or cultivate fresh herbs for aromatic and culinary use. Ground covers help cool the area and reflect heat. Misting systems utilize the power of flash evaporation for instant cooling and are especially effective and convenient in desert climates. You can lower the temperature of your patio by 15-20 degrees with a misting system and they perform their task efficiently with only a few gallons of water per hour. If you enjoy the sight and sound of water, you can choose from a wide variety of pools, fountains and waterfall arrangements that include in-ground, free standing or wall installation. Depending upon the water feature and available space, you can even create a flowing brook, complete with a miniature bridge or install pathways that meander throughout a large garden. Jacuzzi® hot tubs offer therapeutic hydro-massage to ease your sore muscles and relieve stress. Today’s energy efficient models are available in multiple styles, shapes and colors, and incorporate LED lighting, programmable cycles and built-in stereo systems. A Jacuzzi® provides you and your guests with a luxury spa experience. 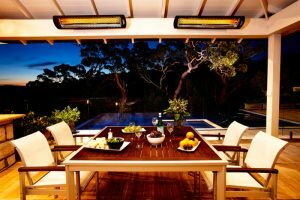 Privacy, seclusion and protection from the sun are paramount in your outdoor area. Your own unique sense of style and personal preferences will determine the type of shade and screening you choose and how much area you want to cover. Pergolas offer interest, shade and a climbing structure for vines, while curtains provide an air of mystery and a more substantial barrier. Retractable awnings and umbrellas offer multiple shade options and patio covers can be utilized to define and frame a particular area. You aren’t limited when choosing accessories for your outdoor oasis. Outdoor TVs, sound systems and Wi-Fi boosters are available, along with area rugs, swings and hammocks. 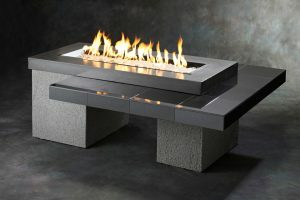 Decorative fire pit covers are offered that can double as a built-in game table. You may want to add the melodious tones of a wind chime, tuck a whimsical lawn ornament in a corner, or include a birdbath for local wildlife. Arid climates present a myriad of opportunities for using outdoor living spaces year-round and you’ll want the area to combine beauty with functionality. Utilize abundant colors and textures to artistically blend with the natural surroundings or create a space with a specialized décor theme. Orient the direction of your outdoor living space to take advantage of the best views. There’s no right or wrong when it comes to outdoor living spaces and Outdoor Living Concepts provides a comprehensive range of ideas to help you create an outdoor living space that’s an oasis for the mind and body. Our professionals offer consultation and design services to help make your dreams a reality and make full use of all your available outdoor space.